Christmas Eve is tonight!! Christmas Eve is tonight!! My calendar says Christmas Eve is tonight! Oh no! I am not ready yet! Where are my warm red Santa undies? Where is my red Santa suit? Why are my warm red Santa undies and my red Santa suit hanging in a Christmas tree? And why did someone put my sleigh in my bathroom? Why are the elves laughing? Why is Mrs. Claus laughing? Why are the reindeer laughing? Christmas Eve is not tonight. But Christmas Eve is just one month away tonight! That is just 30 sleeps! 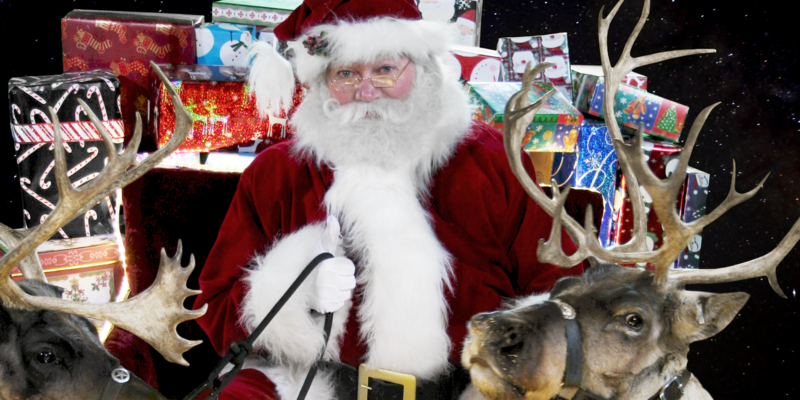 Just one month from tonight the reindeer and I will be flying to your house to bring presents! One month is not long at all. I do not know if I can wait that long. Can you? Oh, sorry. The elves say I can not tell you yet. I guess we will have to wait until Christmas morning now! Ho! Ho! Ho! That is ok. I like surprises. They are fun. Even if they are silly surprises like thinking today was Christmas Eve! I somtimes like surprizes. I dont have red christmas undies. Can I keep Rudolf as a pet? oh?what was that noise on the roof.this is not a time to make a silly joke.now thats enof.look at this place. ok so santa i thought one year i was like 4 years old and i though chrimas was weird but now i dont becuz my brother dosent think ur real and he called u a name andi cant say it insells u ask me but im lisning to my prens and they say that u r still real and my mommy is 38 and my daddy is 40 and i told my brother u were real cuz iu gave my daddy suff for chrimas last year and i said do u think that dad would buy him self stuff for chrimas and he said yes but i said no he wouldet so did myt dad on chrismas he was supriesed to see u gave him stuff and he was happy :)!!!!!!!!!!!!!!!!!!!!!!!!!!!!!!!!!! say bad things about santa cuz i will be very sad and so will santa.santa is the best and nicest guy on the earth at the north pole and in the whole wide world. you and the elves are funny!!!!!!!!!!!! hi. christmas eve is so exciting. santa can you give me a reindeers hoof print. I love suprises they are so fun. oh santa!your very funny sometimes when you put your blogs!=))i hope you enjoy the few days ahead till christmas! Well, Santa-like you said on your e-mail, I’m on the santa blog. I’m a tad nervous about the blogging. Well, I have to go Santa! no I have not had that done, but I have ahd my sister eat your cookies on Christmas Eve! LOl! But I still know you existed… it was just deep down in my heart and my gut. when thay pulled that prank it was silly! hi santa i like pie don’t let mr. mc elfs and reindeer trick bye pie. hi santa do you like pie? i cant wait until christmas day because you get all the nice big presents i hope you get what you want santa. i love reading santas blog.have a mmeerrrryy christmas!!!!!!!!!!! i love you santa !!!!!!!!!!!!!!!!!!!!!!!! Santa I really really love Christmas You are so sweet, I like how you put ho ho ho in red and a Smiley face, well bye!!! Oh Santa!!! You jolly old man!!! I am so excited for Christmas!! Some of my friends sadly don’t believe in you but I know that you are real because you have given me the best gifts ever!!! I love you!!! Oh and you should watch the Santa Claus movie!! IT is good and it shows that you are real!!!!!!!!!!!!!!!!!!!!!!!!!!!!!! I really thought you were going to tell me my presents Santa Claus! i wrote a song for you and everyone at the north pole!!! Angels are singing,Christmas bells are ringing. Christmas is here! spread the holiday cheer! December 25, is a day to prayyyyy! to God and say thankyou for santa and his sleigh!! How’s everything at The North Pole? Please tell Mrs. Claus, The Elves, The Reindeer, and The Animals that I said hi. I like your web site. Hope you’re doing well, and Happy Holidays. I really really need a PC oh you know that mini computer that you can fit in your desk well I just really need one and just saying that if you don’t get me one well I guess that would be ok!! Santa, I wish it was Christmas Eve!!!!!!!! I can’t believe your friends at the North Pole played a trick on you!!! santa santa santa how oculd you get tricked by those elvesand mrs.clause i think for christams i should play a trick on you and say that i have stale cookies but they are really fine!!! wait now i cant because i just told you noooooooooooo!!! how many reindeer do you have in all? How do you fly all the way around the world in one night? How many elves are there? Do you have any other pets? How long does it take to pack your bag? I hope I am on the good list. I love you. hapy – do not delete the txts or emails. Then call the police. They take these matters very seriously and are there to help you. I’m so excited about Christmas! dear santa i cant wait tell christmas this year of 2009.ho ho ho ho. I miss everyone in the Northpole!! It’s not even Thanksgiving yet and i have already started decorating!!! I LOVE CHRISTMAS!! Especially decorating… oh and did i mention i also love the messes the elves leave for me!! you are so silly santa you thought tonight was christmas eve!i hope you are not inbarrest i hope you have a nice month making toys for boys and girls well for nice ones that is!! !well other than that have a merry christmas well today is not chrismas in 30 days it will and i well my brother and mommy will leave you a yummy snack!!! You are so silly Santa. I can’t believe that you fell into the elves and Mrs. Claus playing a trick on you. I am super excited for Christmas this year! I love surprises too! I always get butterflies in my stomach before I get surprises. Ha Ha Ha. I can’t wait to send you an email later when it gets closer to Christmas. I will also write a letter to you again this year. So I hope to hear from you soon! I didnt know Santa Claus what THAT easy to trick! 😀 Those elves and reindeer are just seem like to much fun! And I CANT wait! It seems like Christmas is 1000 days away! Silly Elves One Christmas Eve My Brother Told Me It Was Christmas When I Was Sleeping Yeah I Got Tricked Before! you’re unny Sant, but I guess you are as ecited as I am. Previous PostPrevious Santa Claus’ Christmas Blog is back!